Add Joe Hutto to my list of favorite authors. 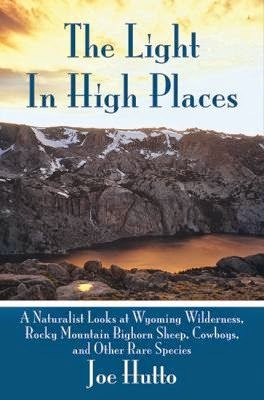 After finishing Touching the Wild: Living with the Mule Deer of Deadman's Gulch, I had to read his previous book The Light in High Places: A Naturalist Looks at Wyoming Wildness, Rocky Mountain Bighorn Sheep, Cowboys, and Other Rare Species. The subtitle well describes the wide-ranging subject matter, except it does not indicate how autobiographical a book it is. Anyone who has been charmed by Hutto in Touching the Wild or his early book Illumination in the Flatwoods: A Season with the Wild Turkey will want to read what Hutto tells about himself. He is a most interesting character. Reading The Light in High Places reminds me how great it was that Bonnie and I went to Wyoming last year and makes me want to go again. Hutto probably does not want the place overrun with tourists, but he sees that well-run, eco-friendly tourism can help with the protection of the places and wildlife that he loves. A reader will see that as a hunter Hutto also sees a place for hunting, but he is greatly troubled by the idea of hunting as sport and big business. The aims of traditional rural life and wildlife conservation are not served by such sport, which caters to people who pay to kill threatened species. Hutto does not consider himself a cowboy, coming from Florida and trained as a naturalist, but he is very respectful of men and women who grew up with traditional cowboy skills. He has learned many of those skills and managed ranches, but he still seeks advice and assistance from the experts. He sees himself as a dedicated scientist and enjoys spending months alone in species studies on the tops of mountains. He tells us how hard such studies are, but I bet many of us would like to join him for a day or two. Imagine the vistas! If Worldcat is to be trusted, there are just about 150 copies of The Light in High Places in U.S. libraries, only about three per state. Illinois has eight. I think there should be more copies available. I am afraid Hutto and his eloquent books are among the rare species in need of attention. They should not be allowed to disappear unnoticed. Hutto, Joe. The Light in High Places: A Naturalist Looks at Wyoming Wildness, Rocky Mountain Bighorn Sheep, Cowboys, and Other Rare Species. Skyhorse Publishing, 2009. 281p. ISBN 9781602397033.